We are very pleased to inform you that for the third time in a row our law firm has been named Poland Law Firm of the Year - National. This is the fourth time that DZP has won this Chambers Europe Award for Excellence, having been honoured by Chambers and Partners in 2008, 2011 and 2012. The ceremony took place in London on 25 April. The citation from Chambers said: "With country-wide coverage, a full-service offering and excellent client feedback, DZP retains its status as one of the foremost domestic firms. It is an undisputed leader in public procurement, and has had a remarkably strong year in energy and environment work. In a landmark instruction the firm assisted PGE EJ in relation to the construction of the first nuclear power plant in Poland. A forerunner in corporate/M&A, dispute resolution and life sciences, the firm is regularly instructed by a diverse clientele, including Getin Noble Bank, LOT Polish Airlines, Skanska and Bauer". This distinction is awarded by Chambers & Partners in recognition not only of achievements in the area of legal advisory but also of the law firm's strategic development, its client services, and the achievements of individual lawyers during the year. 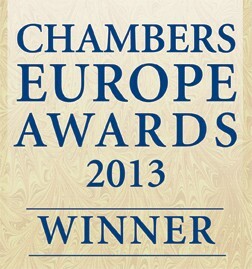 Please go to www.chambersandpartners.com for details of the Chambers Europe Awards for Excellence. Since 1999, Chambers & Partners has been researching the legal profession in Europe, identifying leading lawyers and law firms through interviews with thousands of lawyers and their clients. The Europe guide provides in-depth analysis of the legal markets in 51 jurisdictions.